INDESmed compression socks are produced with 25mmHg (100% compression) in the ankle area, 17mmHG in the calf (70% compression) and 12.5mmHg (50% compression) in the popliteal fossa (back of the knee). Gradual compression socks are necessary to improve the blood flow and muscle oxygenation, pushing the returning blood flow from the bottom of your legs up towards the heart. They relieve heavy and aching legs with daily use, and reduce muscle fatigue and vibration during sport practice. Ideal to treat or prevent varicose veins . Made of Bamboo, Nylon, cotton and elastan, BambooSmarTec® fabric is designed for people who demand professional compression socks with extra wicking properties. Bamboo fiber natural properties are recommended for treatment of some skin changes due to venous disorders, such as eczema and dermatitis, specifically around the ankle area. -Stage I, telangectasia or reticular veins. Sport Usage, Improve your performance! Reduce calf strain, muscle soreness, and recover faster from hard workout. Wearing INDESmed's compression socks during a hard training will reduce fatigue on your legs and lower your HR; wearing them after hard workout will help elimination of lactic acid and toxins accumulated over the muscles. Our recommendation: always wear one pair of INDESmed's compression socks during sport practice, and other one for about two hours after hard workout. Please note that you should always follow your Doctor's instructions. Just choose your bamboo compression socks according your shoe size; see our size *chart. 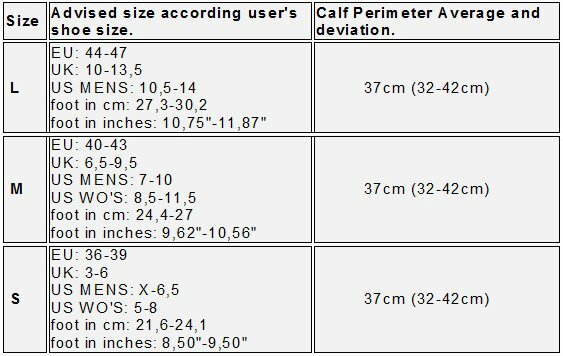 Do not worry about calf perimeter, as specified compression levels are calculated for an average calf perimeter on each shoe-size range, and can happend a small deviation of ±2.5mmHg. *This chart is based on european-sized shoe brands. For an accurate fit, you can use an ordinary ruler to measure your foot.